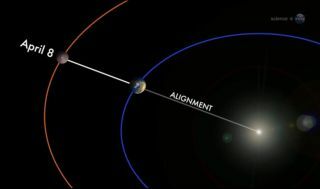 Mars lines up with the Earth and sun on April 8, 2014 in a what scientists call an "opposition." Oppositions of Mars occur every 26 months when the Red Planet and the sun appear on opposite sides of Earth. Mars takes the celestial stage Tuesday night (April 8) when it lines up with the Earth and sun in a kind of cosmic preview to the Red Planet's closest approach to Earth during a total lunar eclipse later this month. The year 2014 is packed with amazing night sky events. See the year's most exciting celestial events to mark on your calendar in this Space.com infographic. Tomorrow's alignment between Mars, the Earth and the sun is called "opposition" because Mars and the sun are opposite to each other in our sky. Opposition and the date of closest encounter are slightly different because Earth and Mars are not in perfectly circular orbits. Oppositions between Earth and Mars happen about every 26 months because the planets are relatively close to one another. NASA and other agencies often take advantage of these close approaches to send spacecraft that way. A recent example is NASA's Mars Atmosphere and Volatile Evolution probe (MAVEN), which launched in November 2013 and will arrive this September. India's first Mars orbiter will also arrive at the Red Planet in September after its own launch last year. The opposition of Mars comes just seven days ahead of the planet's closest approach to Earth on the night of April 14. The Red Planet and Earth are converging ever closer to their cosmic encounter at a rate of about 186 miles (300 kilometers) a minute, according to a NASA skywatching advisory. On April 14, Mars and Earth will be only 57 million miles (92 million kilometers) apart. This is a bit more than half the distance between Earth and the sun, which is about 93 million miles (150 million km). By coincidence, Mars' closest approach to Earth occurs on the same night as a total lunar eclipse. Weather permitting, observers could see a blood-red appear to glide just south of ruddy Mars as it passes through Earth's shadow in the late-night sky. This should make the planet easy to spot in the constellation Virgo while the moon, just a few degrees south, is in total eclipse as seen from North America. The total lunar eclipse starts at 2 a.m. EDT (0600 GMT) on April 15. The moon will spend 78 minutes in totality starting around 3 a.m. The moon will turn a Martian-looking red during the eclipse due to light from the sun shining through the Earth's atmosphere. Editor's note: If you take an amazing skywatching photo of Mars or any other night sky view, and you'd like to share it for a possible story or image gallery, please contact managing editor Tariq Malik at spacephotos@space.com. Follow Elizabeth Howell @howellspace, or us @Spacedotcom, Facebook or Google+. Original article on Space.com.